As it turns out, may not be economical only phones or laptops, this category is also in the midst of firearms. When you see that one or another model called cheap and made on the basis of a different model with a gun highest price, then completely natural question: what specifically preserved and how it affected properties and reliability? Yet, the issue of such options firearms involved in the main famous weapons company, one whose name is associated with quality, so worried that the gun fall apart in his hands at the first shot, do not worry, but to understand what exactly economical option differs from own this grandparent still stands. 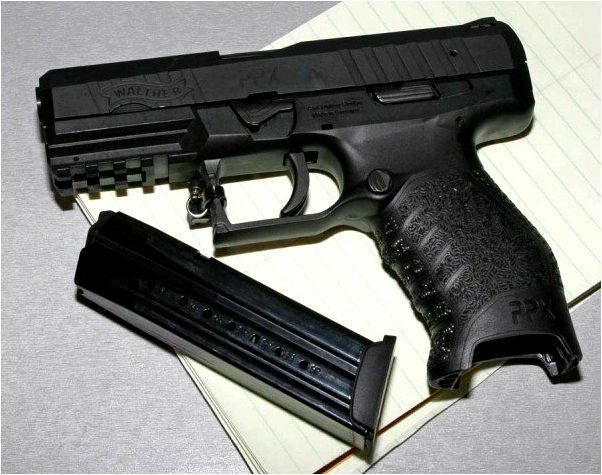 In a previous article they talked about gun Walther PPQ, which is characterized by particularly resistant to salt water. This model is relatively new girl, but she had already proved themselves to be only on the positive side. It is unclear how the manufacturer is familiar with the saying «strike while the iron is hot», but that it keeps its analog, certainly because this year introduced a new gun, one based on the PPQ, and already in 2013, the model can be behold on stores, obviously not Russian. 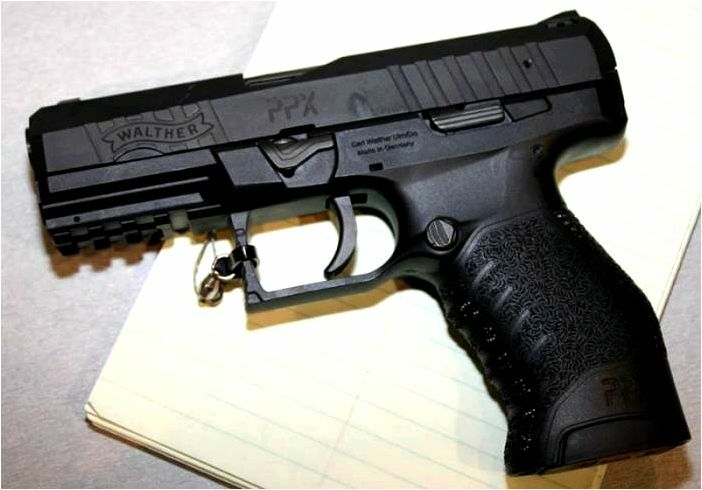 Dubbed this pistol Walther PPX and he is one hundred percent repeats a design your own older brother, one of its value differs very little character, though many it may not seem such too low. Thus, in the not to distant future it will be possible to become an owner of this pistol for $ 499, however, this value recommended by the manufacturer, so it is unclear how traders will be stingy. But the cost per instrument, in which the casing shutter blued model with the housing-bolt stainless steel will cost $ 549, which is also the recommended price. For comparison, we can say that the progenitor of the gun is worth about $ 560, although many take it even for $ 450, and in some cases it costs more than $ 1,000. In general, read about what the real cost will be in this gun is too early, because a 2-price stores located next to the instrument can vary considerably, not to mention the extensibility prices in different countries. Yet, the manufacturer has a weapon as economical, try to find out what exactly is the «budget» part of the gun. First, that is on the mind — is the lack of an automatic safety on the trigger. For all non-automatic fuse all this so you do not, which raises questions about the safety of the gun. In general, the gun has a trigger mechanism only double act, which partly solves the problem, but still with a cartridge in the chamber this gun personally I would cause trouble, especially if it is already significantly Ponos. As they say, in our case better safe than nedobdet so bdim. This gun is positioned as a tool for self-defense and veselitelnoy shooting. So with the second can completely agree, but the introduction of a gun for self-defense is somewhat surprising offer from the manufacturer. Please note that the instrument has a length of 180 and 184 mm (9×19 rounds and .40 S & W), although the weight without ammunition is a bit less than 700 grams, which is not so much. The second drawback I would not referred to the most streamlined shape tools, the availability under the barrel fastening strap for additional devices such as compact flashlight or laser pointer, for what might catch odezhka or something else that will slow extraction tools. In general it is considered for severe minus should not, as well as the fact that the gun has no safety devices. Speaking honestly, I personally have this model simply does not associate with a gun for self-defense, and faster, what is a worldview is not in my 1st. As can be understood from the above, one gun will not run in the version chambered for the 9×21 IMI, but only a 2-under most versions vserasprostranennye pistol ammunition. Capacity stores will be similar PPQ — 15 (17) rounds and 12 9×19 (14) .40 S & W. However, make a note here that this is the probable capacity of shops, and in almost all cases it will be limited to 10 rounds in accordance with the legislation of any other country. Sights Pistol hundred percent like his forefather and are in the form of unregulated rear sight and front sight with imprinted their marks accumulating light paint. But the controls have been significantly changed. Instead longish lever slide stop button is used a relatively small version of this element, which is located in a small depression in the plastic frame guns. He is not duplicated on both sides of the gun, as well as retainer to disassemble the gun. Magazine eject button located on the left side of the standard pistol, but can be moved to the right side. 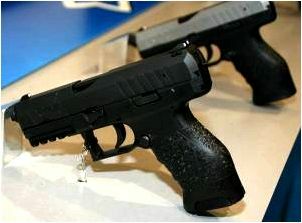 So these external differences already they say that the gun is more than a cheap model, if Walther PPQ. But the main feature of this gun is that it does not use the same cover that in his older model, adapted for use near the sea water and not afraid of it. In general, what exactly would it be for carpet, while silent, but the exhibition has been said that the gun will not differ low operating life and a cheap way to protect your gun parts from corrosion. Automatic pistol, of course, works on the principle of efficiency in the course of a small trunk. Bore is locked by means of the projection of the clutch chamber and window to eject spent cartridges. Shock-type firing mechanism with semi-covered hammer, but the hammer is quite hidden in the housing-bolt gun. So all in all this gun is nothing special is notable, though its design is based on proven years of the scheme, so that the question of reliability features and is solely for implementation. That’s such a pretty ordinary standard tools, can be positioned as a budget, will be available next year, but not for us and not us.